Are you looking for a Personalized flag display case ? 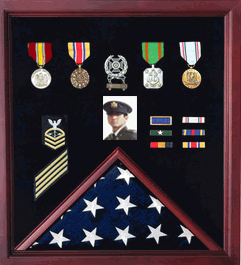 Look no further than your online leader in flag cases, burial flag cases, flag and pedestal display cases, military medals and awards display cases, historical flags and much, much more. Are you looking for a Personalized flag display case ? Look no further than your online leader in flag cases, burial flag cases, flag and pedestal display cases, military medals and awards display cases, historical flags and much, much more. Flag Connections has the highest quality products, which are proudly made in the USA, at unbeatable prices! These beautiful Personalized flag display case, are cherry or Oak. Personalized flag display case and medal cases are the perfect military gift idea. It can serve as a veteran flag display case, and can hold a flag and certificate for a 5 x 9.5 flag or a 3 x 5 flag. Our Personalized flag display case are proudly made in America. Only the highest quality materials are used to make this wonderful piece for your living room, home office or fireplace mantel! If you received a 5 x 9.5 burial flag, it is something that you absolutely must protect and preserve. The flag is not only a symbol of this great nation, but also a clear and powerful reminder of your loved one's service to our country. You need to protect that memory for generations to come.